I’m not a great one for dishing out writing advice. There’s no real reason why I should be anyway. It’s not as if I’ve scaled the dizzying heights of Broadway or Hollywood or been buried in Poet’s Corner or anything. Still, I’ve been writing and thinking about writing for most of my life so you could be forgiven for thinking I might have something to offer. But I don’t, not really. As far as I’m concerned, this is no bad thing. I sometimes feel there is quite a bit too much writing advice abroad in the world as it is. Everybody-and-his-Cousin-who-Once-Wrote-a-Birthday-Card seems happy to dispense their version of the ‘Writing-Meaning-of-Life’ with enough earnestness to fill a small bath. I treat writing advice in much the same way as I see if pasta is cooked. I tend to throw writing advice at myself and see if it sticks. If it does, it’s good. I will pretty-much listen to anyone who has anything to say about writing but, if I find I can’t use what they’re telling me, it will just slide off me and onto the floor. The few bits of advice that actually stick will be left in place until they are crusty on my T-shirt and utterly irremovable. But back to little old me, writing and writing. Surely I must have something to offer, something of my own. There is a tiny tap on the door and a girl peers in. She might be twenty or twenty two. I’ve never seen her before in my life. She approaches my death bed quite tentatively. I might, after all, be contagious. “I know that one, I’ve read your ‘Collected Blog Posts’. Everything you write. No matter how big or small. 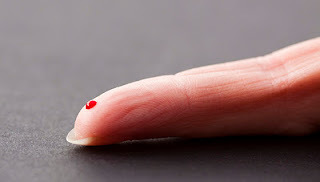 Prick your finger and squeeze a little drop of your own blood into it. For years I wrote like it was a technical exercise. I plotted stories and created characters and chucked a bit of fancy-pants dialogue in and thought it was fine. But there was nothing of myself in there and this showed in the hollowness of the end-product. Somewhere along the line, I seem to have learned that a piece of writing will struggle to be any good unless you insert at least the tiniest piece of your very ‘being’ inside it. The great trick with doing this is that this ‘drop of blood’ is at its most potent when it can’t be seen by the reader. It needs to be like some herb or spice going into a stew, totally assimilated, never to be seen again, but still flavouring everything. In fact there should be "A Little Drop of Blood" in everything we do in life. Thanks Grannymar, lovely to see you there. Thank you for this. I can barely get through an hour let alone a day without writing something in my head. I wake up and it's words. I remember in my sleep. Every train journey home is a story I don't write. I want to write. I need to. Yet I endlessly second guess myself and teeter between feeling inspired and intimidated. Both reflective and original works I struggle with how much of myself I let in there. And yet I can't seem to do it any other way. I always fear that anything I write is too self absorbed and end up writing nothing. It's not that I care what people think so much as I fear they won't understand. Mostly I've slowly started writing over the past few months because I have to for myself. Because even if no one ever hears my thoughts or stories I hear them. So..thank you for reminding me my words alone for me are okay. Preaching to the choir, old son. It’s why I can’t quite get to grips with people who just write stories. I’m not saying that what we write shouldn’t be entertaining but it shouldn’t be just entertaining; it should aspire to be something more. There is a joke about a wonder-rabbi at his death-bed, with all his diciples gathered together to hear his last words. The wonder-rabbi murmurs "Life.... is like.... a bagel." All his disciples are abuzz with the message: "Pass it on: The wonder-rabbi says life is like a bagel!" The word is passed on till it reaches the synagogue-sweeper, the lowliest of the flock. He asks" "Life is like a bagel? How is life like a bagel?" The buzz starts again as the question propagates back to the deathbed of the wonder-rabbi: "Wonder-Rabbi, How is life like a bagel?" The wonder-rabbi pauses for a moment and then says "Okay, so life's not like a bagel." And then he dies. Blood and bones and soma and guts and sensuality and all the messy bits of life. Yes. Lots of writers seem to think it's a purely intellectual exercise, a nice diversion and game for the verbal part of the mind, and forget to include the body and soul and blood and bones, etc. That's why so much writing is so very dry and unreadable. Your advice here is brilliant. It needs to be taken to heart by more writers. I've been having arguments with poets on this very point for decades. Contemporary poetry is way too much head and not nearly enough blood. Once you figure out the puzzle-box, why bother re-reading when there's no pleasure in it? Jim: I knew I had nothing new to tell you hear. Love the wee joke. I've been reading your posts since 2008? and every time I read one of them, a new perspective is added to mine. But I had wondered often if these were really "drops of blood" from you. Now I understand, correct me if I'm wrong, these posts strike a balance of who you really are and what you want the world to know. Thanks for that insight, a drop of blood into one's writing would really lend more meaning and "soul" into one's post. Dear Jena Isle, you are indeed a most constant visitor - something I appreciate greatly and never take for granted. Ken, I REALLY enjoyed this post of yours. Good to see a few familiar faces in your comments as well. I got a huge kick out of Jim's joke. Writing advice is dangerous. I have plenty of books filled with mumbo-jumbo in my bookshelf. I've often wondered if maybe we'd all be better off if the authors of these books had written them when they'd first started out rather than after they've gotten the credentials to convince an editor they can make sales. By that point, I'd wager many of these authors have forgotten what it was like to be small and fragile. I used to subscribe to writing magazines, but it didn't take long to realize that 5 Ways to do... every single month was more hogwash than anything else. The only dependable way to learn how to write, in my opinion, is to actually write. If you spend all your money on writing books, you're moving in the wrong direction. Learning how someone else writes won't teach you how to be... you. If you get sick and end up on that deathbed, even if it's when you're 85, you better let me know so I can come visit you! We can pretend we're pirates and down a bottle of rum. If you're not feeling up to it, I'll finish it for ya! Okay, it might have to be a wee bottle in that case. a piece of writing will struggle to be any good unless you insert at least the tiniest piece of your very ‘being’ inside it. .